If you're looking for a cute, versatile stamp set and some fantastic new stitched dies, head straight to page 28 of the Occasions Catalogue. Amazing Life has beautiful swirly words and lots of extra bits to go along with them. I used my stamparatus to stamp the words on this card, in Gray Granite ink. The cake was stamped in Black Memento ink and then I coloured it with my Blends. The base card is Melon Mambo. 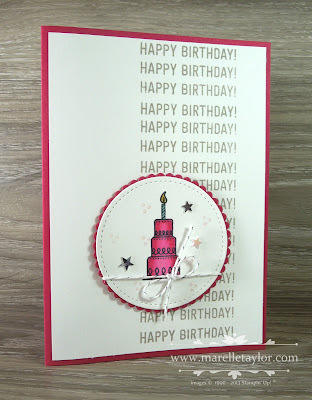 I stamped a few background elements in Powder Pink and added a few Twinkle sequins. Silver Twine is the finishing touch. I was so excited to see Rectangle Stitched Dies in this catalogue. 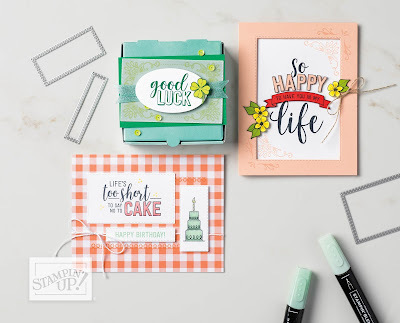 As you may have noticed, I use my Stitched Shapes framelits ALL the time, so adding these rectangles to my collection was a no-brainer!